This is my second and final time hosting a recipe for Sweet Melissa Sundays. The group has nearly baked their way through every recipe in the Sweet Melissa Baking Book. Only 3 recipes remain after this one with our final posting date on August 21st. I'm sad to see the group near its end, but also excited because we've recently embarked on baking our way through a new book, Baked Explorations. Club: Baked kicked off it's first recipe on July1st and we are baking twice a month, posting on the 1st and 15th. To join the fun head over to the Club: Baked site and get in touch with Karen. Now, on to the important business. Pie. I will admit that I selected this recipe to host before fully reading it through. Mind you, I didn't have a lot of choices since we are down to the last handful of recipes. But I had a moment of dread when I finally did read through the recipe. It had a lot of steps and a couple of non standard (in my kitchen) ingredients. Tapioca pearls and almond paste. I did find the almond paste, but not the tapioca pearls. I ended up using more cornstarch in place of the tapioca, which worked out just fine. The tapioca helps with thickening the fruit filling, but the cornstarch did the job. This pie is best made over two days to reduce stress and mess in your kitchen. Day one make the base crust and the almond lattice. Cover both in plastic wrap and refrigerate overnight. Day two wash and cut the fruit, make the filling, assemble the pie and bake. I baked my pie for the full time called for in the recipe but had to lightly cover it with foil to prevent over browning of the lattice crust. How did it turn out? Pretty. And tart. Too tart for my taste. But still pretty. I've never been a fan of the skin on plums. I like the flesh of the fruit, just not the skin. This recipe calls for leaving the skins on and I was hesitant to do that. So I decided to compromise and leave only half the skins on. I should have gone with my gut. Unfortunately the pie was overly tart, despite the fact the inner part of the plums was sweet. The almond lattice was delicious, though. And so was the crust. This was my first time making Melissa's Flaky Pie Crust and it turned out great! I would definitely make it again. It didn't have the issues I have seen in the past with her all butter pie crust shrinking. 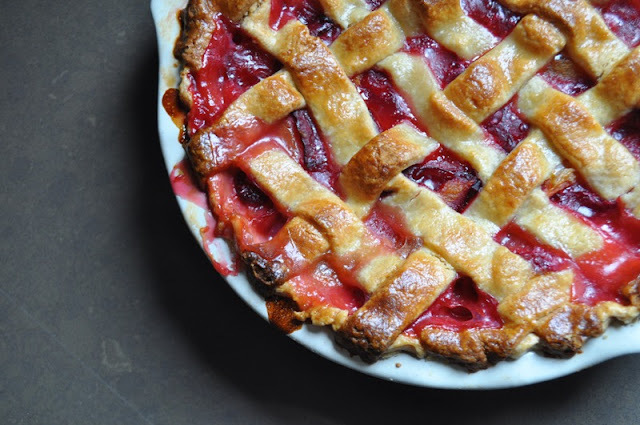 The almond lattice would make a great top pie crust for a number of fruit pies, such as cherry or blueberry. It's tasty and beautiful, with the bright fruit oozing up around the basket weaved sweet almond pastry. A quick note about the almond lattice. It's delicate and requires a little special attention. You start by rolling out the dough between lightly floured parchment. The dough is transferred to a baking sheet and cut into long strips with a pizza cutter. Then the baking sheet goes into the refrigerator for at least 20 minutes, if not longer. Don't try to separate the strips until after the dough comes out of the fridge, nicely chilled. Here's where you have to work quickly...the strips can be challenging to remove without breakage. I used a small spatula to coax each strip off carefully in one piece. The colder the dough, the easier it is to work with. I would even recommend placing both your partially assembled pie and the strips back in the fridge if things get too warm. I made this pie for Father's Day and served it with Melissa Murphy's Brown Sugar Vanilla Ice Cream. The ice cream was wonderful and sweet which toned down the tartness of the pie. If I make this pie again I would definitely omit the plum skin. Looking forward to seeing how every one's pies turned out. Thanks for baking along! Note you only need 1/2 the pie crust recipe. I made the full recipe and froze half the dough. Place your butter and shortening in the freezer while you prepare the rest of the ingredients. Prepare a glass of ice cold water. In a medium/large bowl whisk together flour and salt. Drop cold pieces of butter into flour mixtures and quickly toss to coat butter in the flour. Work fast so the heat from your hands doesn't make the butter soft or warm. Use a pastry blender (or 2 knives) and cut the butter into the flour until large pea size pieces form, turning your bowl 1/4 turn after each cut. Toss shortening pieces into mixture and lightly coat with flour. Use pastry blender to cut the shortening into the dough until large pea size pieces form. Form a well in the center of the flour mixture and add ice water, starting with half the water and gently pull flour into water using a fork. Dough will start to come together and add remaining water. Dough is ready when you pinch it and it holds together. Add additional water if needed. Turn dough out on a lightly floured surface and form 2 equal size discs. Wrap each disc in plastic wrap and refrigerate for 45 minutes to an hour. After the dough is chilled, roll out one of the discs on a lightly floured surface using a rolling pin until 1/4 inch thick. Gently transfer dough to a 9 inch pie plate. Take excess dough and fold underneath itself so it lays on the rim of the pie plate with going over the edge. Crimp the edges and refrigerate the dough until firm, about 30 minutes. Using a food processor, pulse flour, sugar and salt until combined. Add butter and almond paste and pulse until mixture is course. In a small bowl whisk the egg, vanilla, almond extra and water. Add wet mixture to the flour mixture and pulse until the dough appears uniformly moistened and crumbly. Turn dough out onto a lightly floured surface and form a disc about 6 inches in diameter. Wrap in plastic and chill for at least 20 minutes. Use a rolling pin to roll the dough between 2 large pieces of parchment paper lightly sprinkled with flour. Roll into a round 11 inches across. Remove top piece of parchment and cut dough into 3/4 inch wide strips using a pizza cutter or sharp chef's knife. Transfer the dough still on the parchment to a baking sheet and refrigerate at least 20 minutes. In a small bowl, whisk egg, heavy cream and salt together. Whisk cornstarch, sugar and and tapioca flour in a small bowl. In a large bowl toss the plum and zest together. Gently fold in the raspberries. Sprinkle sugar mixture over the fruit and stir gently to combine. Transfer the filling to the unbaked pie shell. Preheat oven to 350 and line a baking sheet with foil or parchment. Remove lattice strips from the refrigerator and carefully separate each strip and lay it across the pie weaving a crisscross pattern. Press the strips together gently where the strip meets the pie crust dough to join them together. 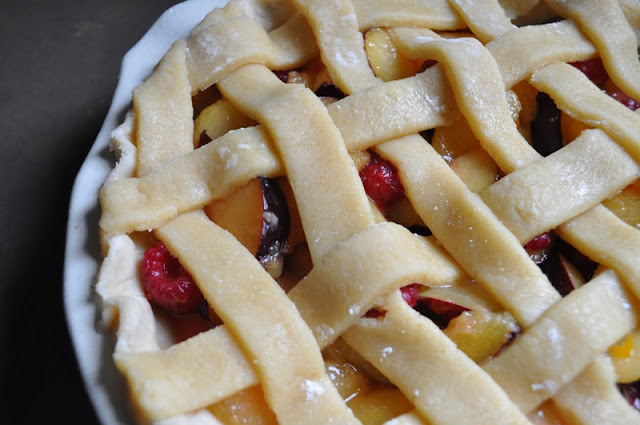 Gently brush egg wash over the lattice and pie crust edges. Place the pie on your prepared baking sheet. Cover the pie loosely with foil and bake for 30 minutes on the center rack of your oven. 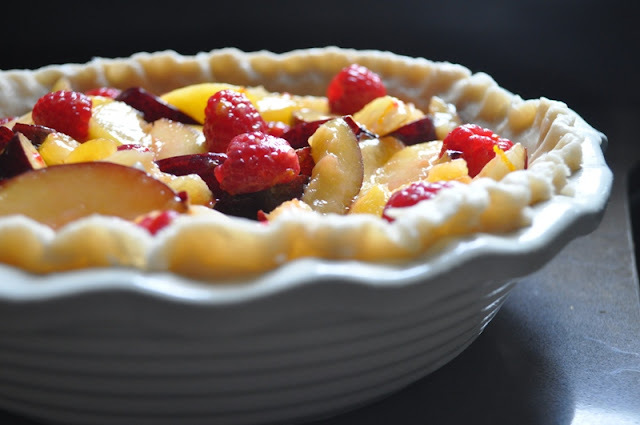 Uncover the pie and continue baking for 90 minutes or until the fruit is thick and bubbling. Cool on a wire rack until pie is room temperature before serving. Look at that lattice - it's gorgeous Gloria! I would never have known you'd had trouble with it had you not said anything. Wait until you see mine :) Love the shot of your slice of pie - just beautiful. Thanks for hosting this week, I adore fruit pies, and despite some struggles with this one, I loved it! 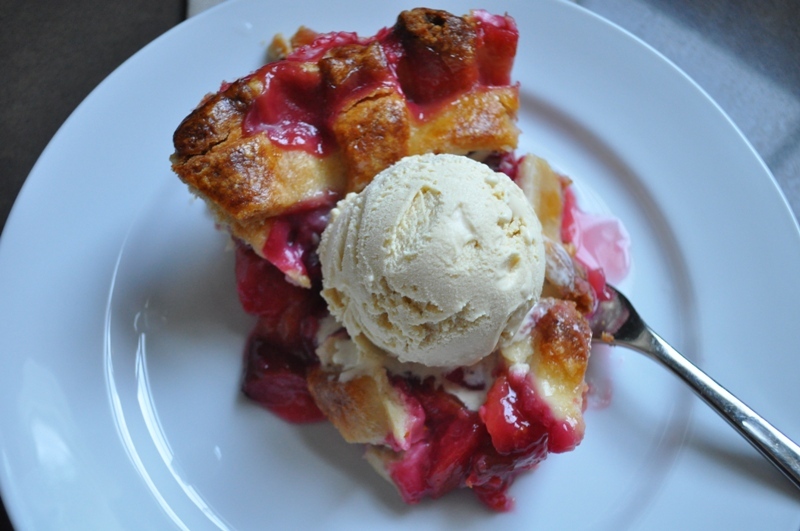 Just having discovered your blog, I'm in love with this pie. Thank you for sharing. Your pie looks fabulous, Gloria! You did an excellent job with the lattice; I got frustrated with the flakiness and just slapped mine on top of the pie. I thought this was the perfect selection for this time of year. It's funny: I actually had tapioca flour and almond paste in my pantry. I had the tapioca flour from some other pie (and really, I don't think it matters if you use tapioca or cornstarch) and I think I must have bought the almond paste on sale thinking it would come in handy some day. Beatiful pie, Gloria. I love that last picture!!! Now that's one of the things that keeps the safari....groovin'!